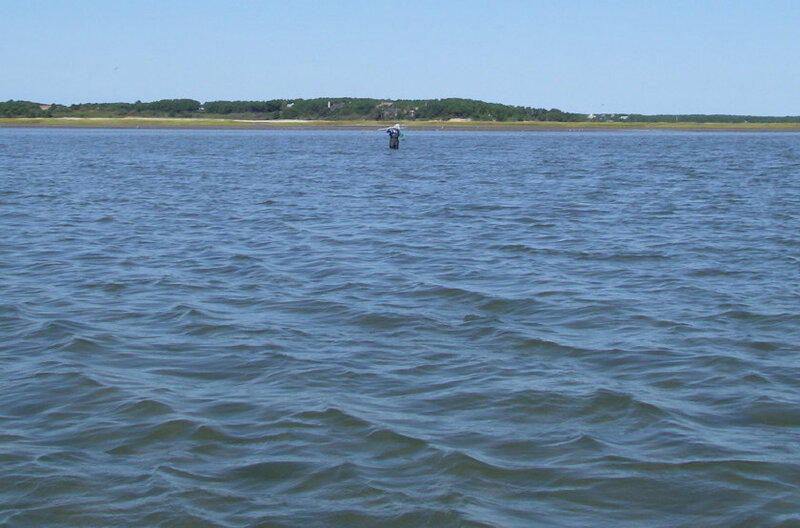 Atlantic menhaden, known locally as pogies, alwifes, and bunker, often school in estuaries during September and October, swimming in very large balls as herd protection from ferocious bluefish attacks. As Hurricane Kyle blew by Cape Cod on Sunday, topping off a long three day weekend of pouring rain, a menhaden school flooded into the inner harbor of Wellfleet at high tide, followed by blues that were followed by local fishermen. The word must have spread by ethernet (among bluefish and humans) because soon fishing poles outnumbered pogies. 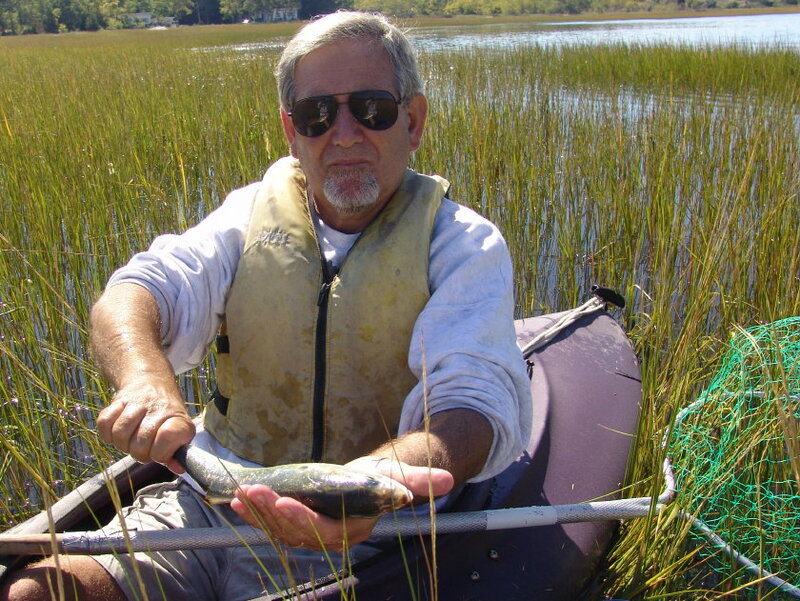 Over the last few years, locals have perceived a significant decline in menhaden. They have petitioned state and federal legislators for action to control the reduction fishery in which menhaden are harvested for the extraction of omega-3 oils for human consumption with the remainder used for aquaculture and livestock feed. 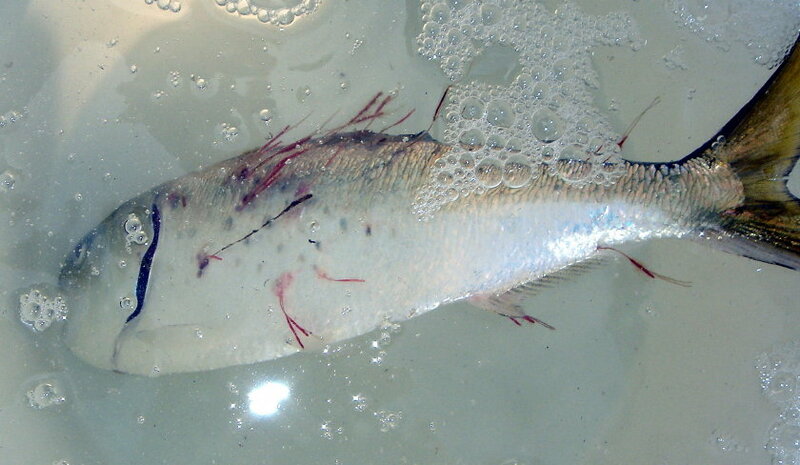 Menhaden are also harvested as bait for both commercial and recreational fisheries. Whatever the cause of perceived overfishing, menhaden form a critical link in the coastal ecosystem and their absence would have a significant effect in degrading the coastal enviroment. In Sippican Harbor off Buzzards Bay, we have been awaiting the arrival of pogies this year. We found no significant concentration of menhaden in the fall of 2007. The last time we documented a major massing of menhaden schools in Marion’s Sippican Harbor was September and October 2006. We are waiting to see if they return in any substantial numbers in 2008. As you can detect in the close-up shots from the video clip, a large percentage of 2006 menhaden were adorned with parasitic copepods. During early October 2005 we documented many large schools of menhaden in Wellfleet’s Chipman’s Cove, south of the harbor pier. 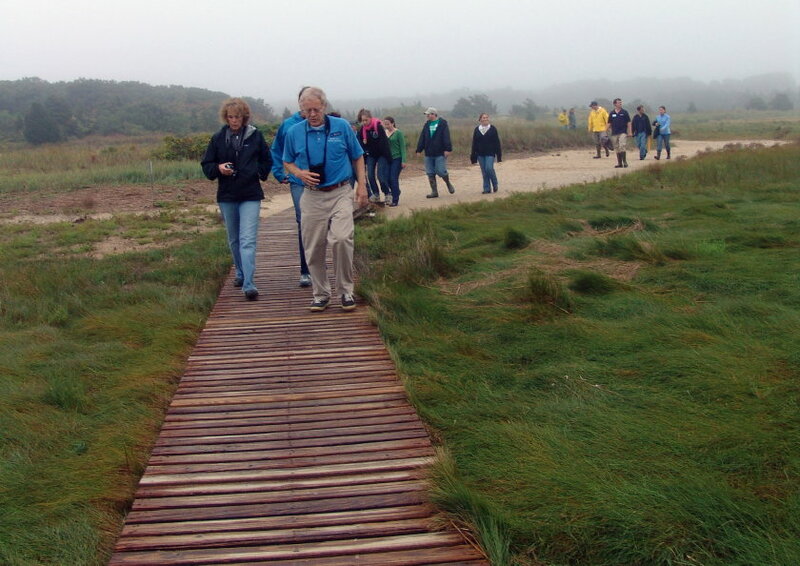 Mass Audubon‘s Wellfleet Bay Wildlife Sanctuary, celebrating its 50th anniversary this September and featuring its upgraded nature center with Platinum-certified Leadership in Energy and Environmental Design (LEED) designation, now hosts a series of tanks to represent the various sanctuary ecosystems from fresh water stream to Cape Cod Bay. In the fresh water tank, visitors have a chance to meet “Snappy,” a young juvenile snapping turtle with a Hollywood A-List attitude. Assuming ownership of the tank, Snappy is always ready to greet sanctuary visitors with his handsome smile and to illustrate “what lies beneath” all those beautiful lily pads in peaceful, pristine ponds. Isn’t Snappy cute? 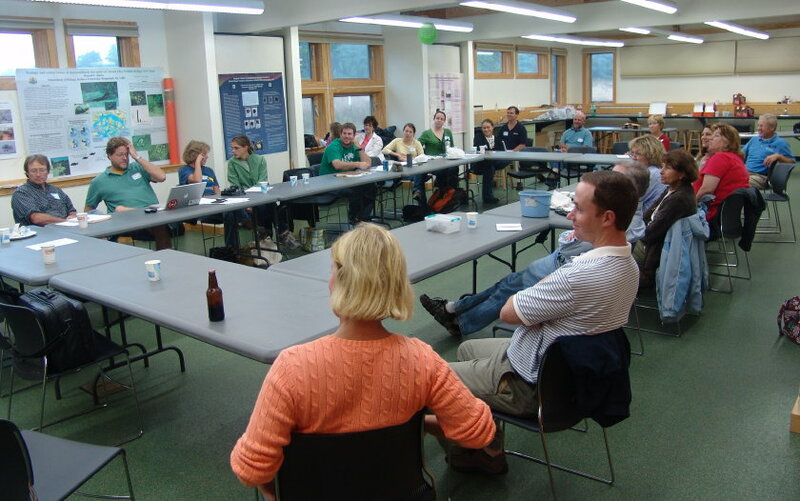 Mass Audubon’s Wellfleet Bay Wildlife Sanctuary hosted the 3rd annual meeting of the Northeast Diamondback Terrapin Working Group on September 27th. Bob Prescott, sanctuary director, and Don Lewis, the Turtle Guy, welcomed more than 30 participants from New England and New York. Chuck Landrey coordinated the meeting agenda, and Russ Burke, Hofstra University professor, chaired the meeting. After registration and coffee, the meeting kicked off at 10:00 am with opening remarks by Chuck Landrey, the northeast regional coordinator, followed by Russ Burke, DTWG chair. Bob Prescott and Don Lewis welcomed participants to the Wellfleet Bay Wildlife Sanctuary and presented a very brief overview of Cape Cod geography and terrapin populations from the SouthCoast to the Outer Cape. Russ topped off the opening session with an update on terrapin research activities within Jamaica Bay and the challenges of wildlife conservation within bounds of the 11th largest city in the world. As entertaining as these opening presentations were, participants earned a nice break before hearing more research updates by Charlotte Sornborger of Barrington, Rhode Island, and Barbara Brennessel, professor at Wheaton College. Eric Strauss, research associate professor at Boston College, talked about environmental studies and the ecological field station at Sandy Neck in Barnstable where he and Peter Auger have conducted long-term terrapin research. Lunch break offered an opportunity for Sue Wieber Nourse and I to zip over to Lieutenant Island to check for emergence nests. Three days of pouring rain and the tropical front accompanying Hurricane Kyle presented conditions favorable for late hatching terrapins to emerge through the soften soil. At the intersection of a one lane dirt road and a driveway on Marsh Road, we discovered an emergence hole with a tiny diamondback terrapin hatchling poking its head out. Excavating the egg chamber we rescued four live hatchlings and found two premature hatchlings that had been crushed inside the nest by vehicular traffic. The afternoon session was devoted to an exchange of information and views on a variety of terrapin research issues as enumerated by the following charts. Topics included headstarting, how do hatchlings know home, list of predatory and beneficial plants, hatchling survival rate, relationship between age and salinity tolerance, unpublished data on diet, terrapins in captivity, legacy data sets, where do hatchlings hang out, starting a basic terrapin conservation program, capture-mark-recapture methods, tracking methods, mating aggregations, nest protector design and temperature, terrapin survey methods, and how do you know what terrapins are doing when not nesting. After a very long and productive day, during which Hurricane Kyle had deluged the auditorium windows and walls with rain, the time had come for a soagy field trip. Participants assembled in the Nature Center and began the trek along Goose Pond Trail to Cape Cod Bay where we would release the female and male terrapins that Sue and I had captured on Wednesday (see The Last Terrapins). Then, we would walk over to Try Island to check the remaining protected nests and to share an insight into nesting habitat here at the northernmost outpost for diamondback terrapins. En route to the bay, we stopped by an exemplar area of salt marsh die-off to talk about this phenomenon on the Outer Cape. I spotted a large male squareback marsh crab, one of the prime suspects in the die-off, guarding its muddy burrow. Bob dove into the ooze and bare-handed the critter; a noble feat since we normally use 3-mil plastic gloves for this work due to the ferocious tenacity of these crabs. Bob showed off his catch to clicks of rain-drenched cameras. As downpours resumed, we reached a creek leading to the bay and released our turtle guests back into the wild. Afterwards, we examined the nesting habitat on Try Island and elsewhere along the Goose Pond Trail, arriving back at the Nature Center tired, soaked and completely satisfied with a most informative and fun filled day. As September chill grips Cape Cod, terrapins head for winter slumber (brumation). Only a few remain active late into the month and they become extremely difficult to find, less active and spending more of their time underwater, surfacing less frequently for air. If you’re looking for turtles to sample this late in the month, one of the best places to try is the Run, a wide, shallow inlet south of Lieutenant Island linking many of the salt marsh channels where terrapins are known to brumate. 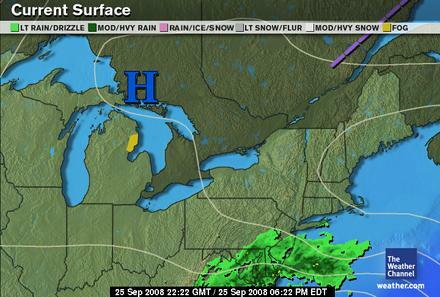 Wednesday’s weather was clear with a brisk northeast wind off the Atlantic Ocean. The air temperature hovered around 60 and the water held in the mid to upper 50s. My legs froze while Sue more intelligently chose waders over bathing attire. Low tide came a 2:30 pm. In the Run, low tide marks the best chance to capture terrapins in the shallow, clearer water. 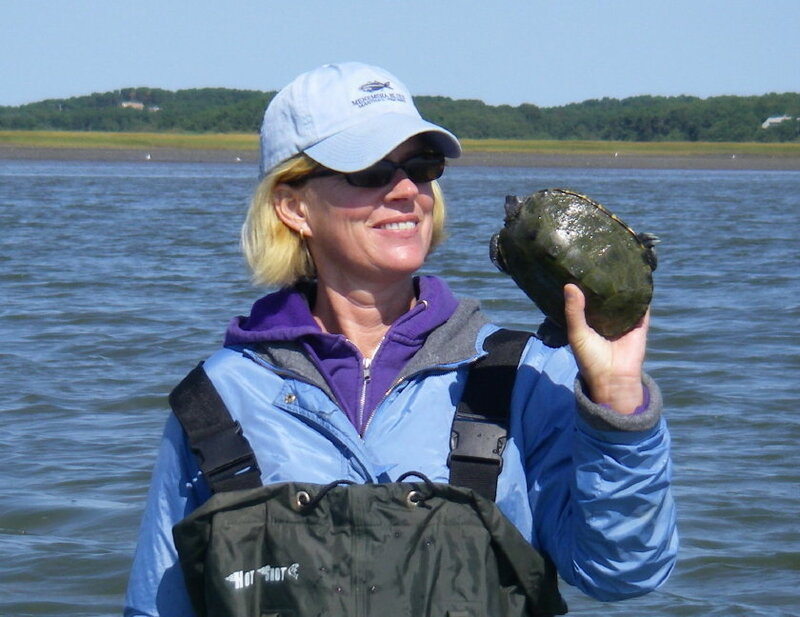 Our first capture was an 11-year-old female that Sue spotted as the turtle raced up channel toward the marsh creeks. We had last observed this terrapin during field school on July 10th as she nested on a sandy bank just off Lieutenant Island. Since then she had gained nearly 200 grams for the long winter ahead. Sue found the male terrapin, lazing motionless on the bottom. it was the first time we had captured this male that measured 12 centimeters long and weighed a little under 300 grams; that is, about 3/4 the linear length and 1/3 the mass of the female. With a meteorological depression heading for the Great White North tomorrow and Saturday forecast to pound the Outer Cape with rain and wind and cold, chances are that this adorable couple will be the last adult terrapins we will capture until field season returns in late April. If history repeats, we will see a few more nests emerge until mid-October, and occasionally we will be confronted in the fall or in very early spring with a cold-stunned adult that didn’t find a particularly safe brumation site. 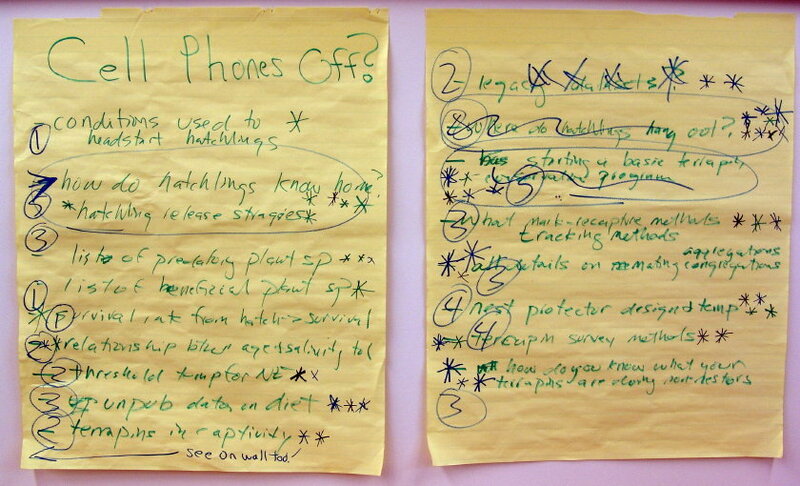 For our active collection program, though, the gavel has sounded for the 2008 field season. The most sacred duty of any naturalist, especially one with thinning silver locks, involves sharing the experience of Nature and recruiting successors among the next generation to continue the critical mission of observation, documentation and conservation. 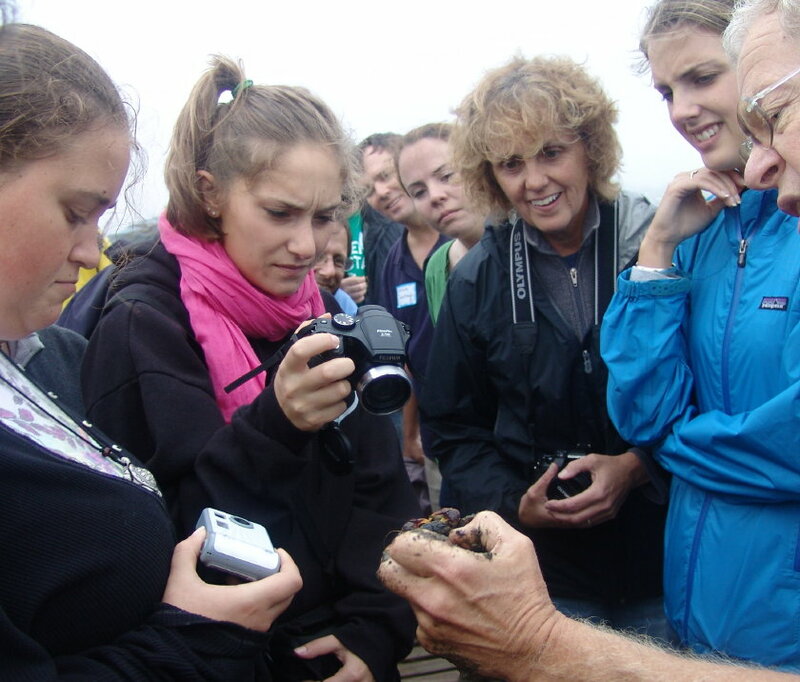 While my colleagues and I employ undergraduate and graduate interns each season to “learn the trade” of field science, our special joy comes from opportunites to engage with the youngest scientists, those for whom an adventure in the wild becomes a transformational experience that may change the course of their lives and the future of our world. Partnering with such exceptional conservation advocates as the Massachusetts Audubon Society, the National Marine Life Center, the Cape Cod Museum of Natural History, and Massachusetts Marine Educators (among too many others to mention in a short post), we have had the privilege to introduce children from nine months to nine decades to Nature through the unparalleled teaching model of turtles. Seemingly helpless hatchlings melt the hardest hearts. I’ve watched jaded curmudgeons with expressions so sour they could change sunshine into hail; I watched their eyes mist as they witnessed a tiny hatchling poke its head through its eggshell at the instant of birth. For children who come to the field with fewer preconceptions of the natural world, these interactions are pure joy. 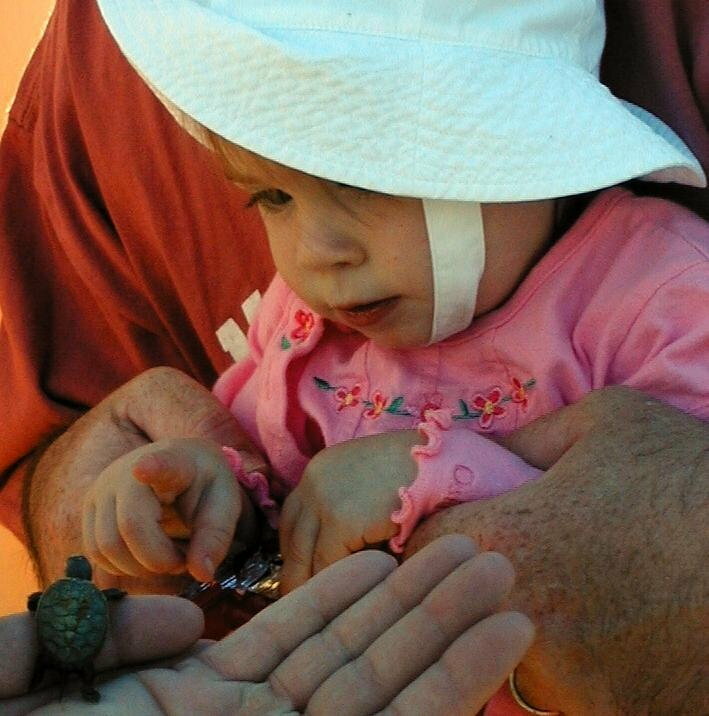 Because turtles, and especially hatchlings, appear so accessible to children, they create an immediate and tangible link with Nature. In decades of wildlife research and education, we have never encountered a person WITHOUT a turtle story to tell. Often an octogenarian will smile the smile of a todler as her eyes beam and she tells the tale of how her dad introduced her to a baby turtle he had found in the pond behind their home. 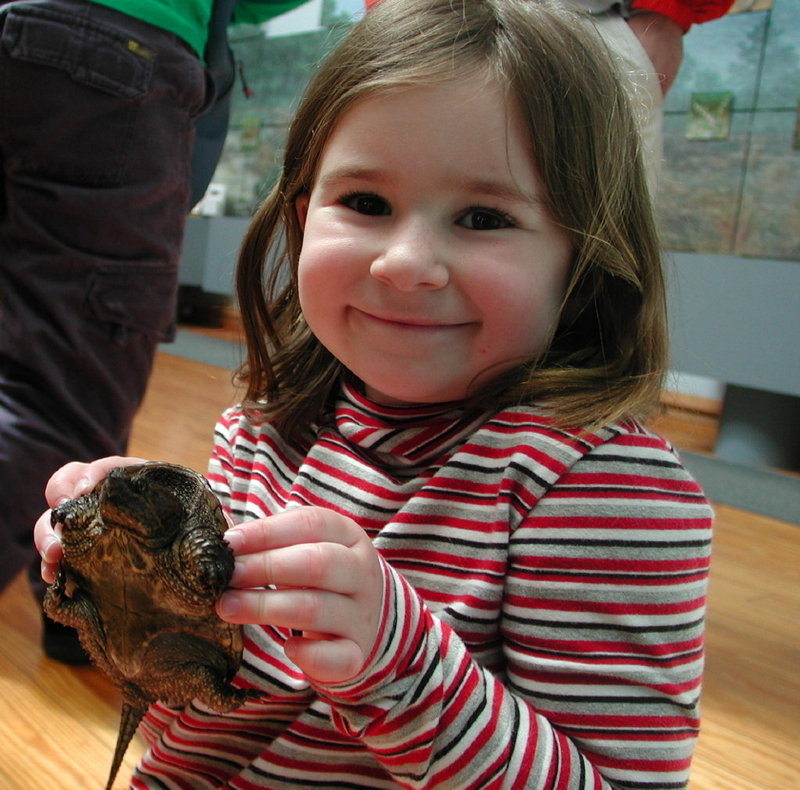 We can never forget the young girl who eagerly and tenderly held a four-year-old snapping turtle at the Earth Day celebration at Mass Audubon’s Wellfleet Bay Wildlife Sanctuary in 2003. We wonder how she showed no fear of what this then timid turtle would become as it grew into a mighty and fearsome snapper. She simply felt the joy of touching Nature in such a personal way. During field season, we use every opportunity to involve children in our research, especially when releasing critters back into the wild. 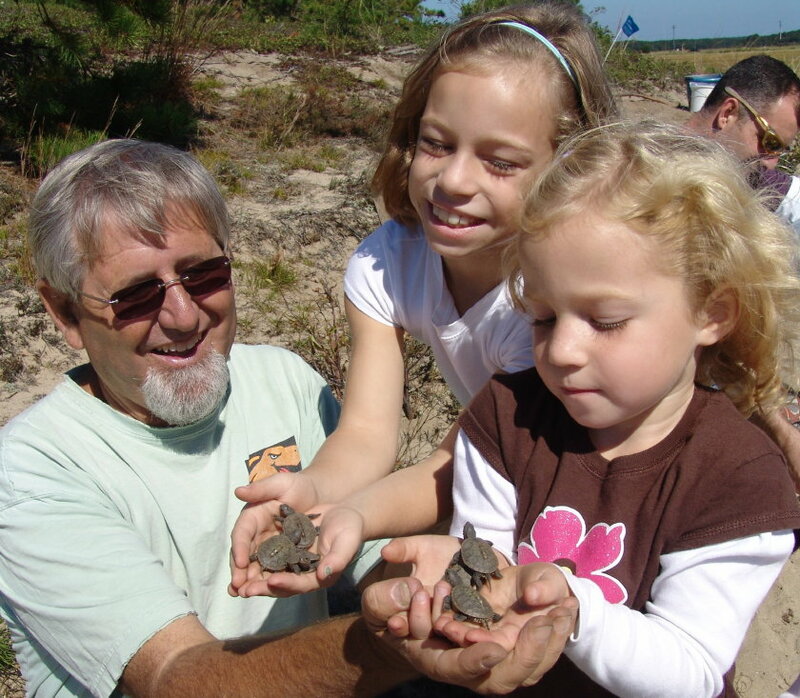 On the beaches of the Outer Cape, the setting is perfect for youngsters to meet turtles in a completely natural venue and to learn about them in ways that books simply can never convey. A message from today’s post? 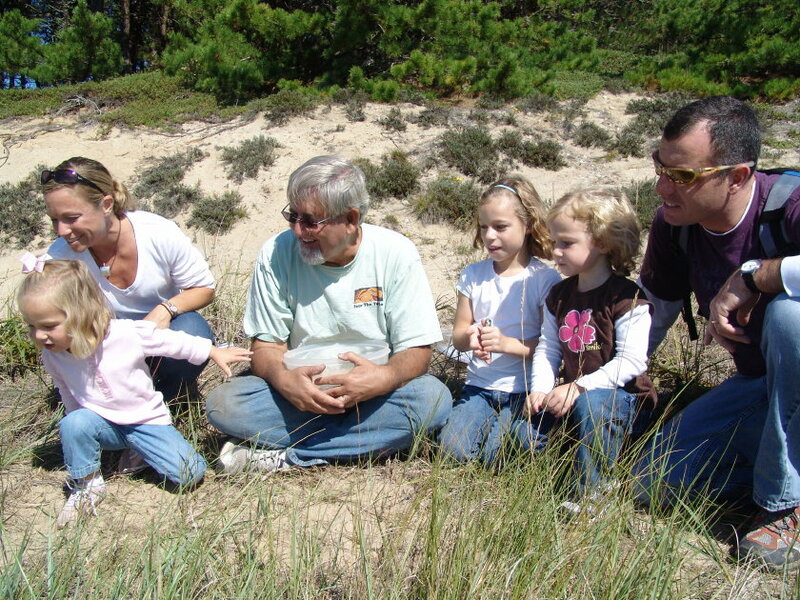 Take every opportunity to introduce children to Nature and show them critters in their natural habitat. The rewards of the moment will be enormous as you see pure, honest joy burst across their faces. But this singular experience will pay dividends for a lifetime as memories form touchstones that will shape the course of their lives and the future of our world. Bring your family into Nature and see what futures you, too, can create. 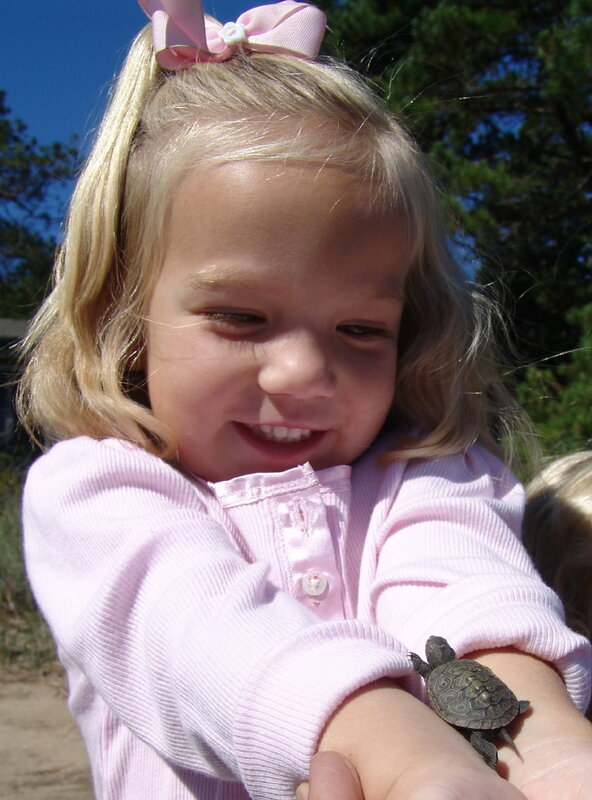 You are currently browsing the Turtle Journal blog archives for September, 2008.